Brampton, July. 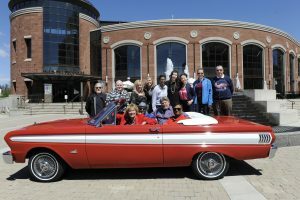 12, 2017 – The Downtown Brampton BIA (Business Improvement Area) is pleased to announce the 17th annual Classic Cars Celebration will be happening in downtown Brampton on July 20-22. The highly anticipated event kicks-off on Thursday evening in the heart of downtown Brampton, Gage Park. The evening will feature a Tribute to Sinatra featuring Jeff Sommerville and the Jazz Mechanics alongside a line-up of classic car displays on Wellington St. set to run from 7-10 p.m.
Classic Cars Celebration will entail five street parties throughout various areas of the downtown core on Friday evening. The laneway parties will begin at 5 p.m. and run until 10 p.m. including Havana Club on George Street, Summer of Love in McArter Lane, DJ Party! in Vivian Lane, Canada ROCKS in Harmsworth Lane, and Times Square Fiesta! in Daily Times Square. Each laneway will feature live entertainment, delicious food and lots of dancing! Garden Square will be an entertainment hotspot on Friday evening with live entertainment from 8 p.m. to 11 p.m. hosted by Brampton Says including Five Times Classical Band and headlining act the Marc Joseph Band. Saturday will be a full day of entertainment beginning with the legendary car parade at 1:30 p.m. The Show ‘N’ Shine will run from 2 p.m. to 5 p.m. followed by the Disney film, Cars shown on the big screen at 5 p.m. This year, the Main Street party will feature extended patios, and live entertainment with this year’s new stage addition! Garden Square surely won’t disappoint with an exciting show put on by Pauly and the Goodfellas from 8 p.m. to 11 p.m.
A non-for-profit organization established to support and strengthen the local business community and help promote Downtown Brampton as a shopping and business district, the BIA represents more than 400 businesses and commercial property owners reporting to a 10-12 member volunteer Board of Directors.